There’s a new buzz in fashion: 3D printed shoes. 3D printing is unique; it works similar to a traditional inkjet printer, but it prints out 3D objects instead of documents. Material is squeezed through a nozzle and “prints” the shoe layer by layer. 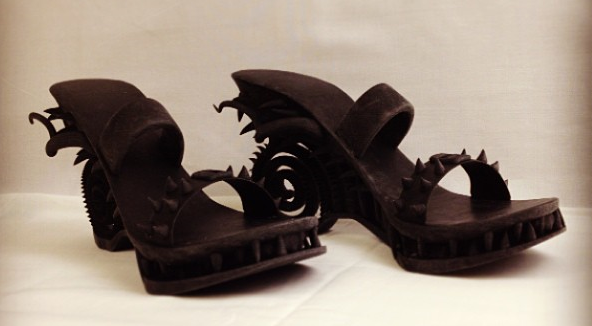 So what do 3D printed shoes look like? Because 3D printers prints the shoe in layers rather than by sewing the shoe with machines, this process enables designs that are otherwise impossible or very difficult to make. Spikes, wheels, pipes, or other design attributes are made as one piece rather than added separately. These Lady Gaga-esque shoes will be available for fashionistas soon, without the need for specialty design requests. The price of the shoes are comparable to designer shoes, albeit slightly more costly. However, the uniqueness of the shoes is well-worth the price. These motorcycle shoes bring a whole new meaning to biker chic. The shoes have detailed exhaust pipes, tires, and taillights. Flames decorate the sides akin to a life-sized bike and will surely set your night on fire. Wear these heels with a sleek little black dress and silver jewelry. Complete the look with a bold purse in fuchsia, bright green, or orange to make it pop. Disheveled hair and red lipstick will give you that windswept look—as if you’ve been riding on the back of a motorcycle. This shoe has the heel of a pump and the body of a sandal, giving it a refreshing, updated look perfect for summer. The heel tapers into a point, adding height and creating a slimming effect. The design along the sole of the heel is reminiscent of threaded ribbons, giving it a playful, innocent look. Pair this with a breezy sundress, oversized purse, and natural-looking makeup for a fun, fresh look. We have the perfect shoe for your inner steampunk. This shoe features mechanical designs reminiscent of a Victorian boiler room. Kelly Root, the designer behind the shoe, states that, “this idea of the metal, gears, rivets and the sort based around the back of the shoe gives the heel more of a mechanical look and makes it almost feel like you could see it expanding and contracting as it’s walked on.” Wear this shoe with your favorite steampunk ensemble such as a corset, Victorian-inspired gown, and top hat. Accessorize with mechanical-inspired jewelry featuring gears and cogs. Complete the look with elaborate make up and may we also suggest an ornate cane or parasol? Nick-named the demonic shoe, this shoe will bring out the devil inside. Featuring teeth-like spikes along the heel and strap, this shoe means business. The coiled design of the heel conjures images of a spiked dragon’s tail. This shoe is worthy of Lady Gaga and we recommend pairing this shoe with an equally fierce ensemble. Need inspiration? Look to Lady Gaga.